I remember going to Tahlequah, OK, to pick up a little buck kid I’d picked out sight unseen and named Goat Town USA Gaius many years ago. He was a little thing, but full of personality. The drive home was an adventure for both of us. When Gaius first came, he went out with the does to eat in the pasture. Yes, Louie went too and usually had to be rescued. Gaius grew fast, but not fast enough that first summer. His deep red grew in that first winter. Once home, I decided Gaius had been weaned to early and offered him a bottle. He concurred with my opinion. As I was already feeding another little buck born blind a month older than Gaius, both were happy with the arrangements. Gaius and Louie were soon fast friends. Both were bucks. Louie was blind with horns and so could spar with Gaius who was sighted and disbudded. Louie was born blind. Gaius seemed to understand this. Louie would go out in the small pasture with Gaius and get separated. When Louie started calling, Gaius would go back to him and lead him on to wherever the next good eating spot was. The two lived in the same pen for years. I’d had a previous buck who literally smashed his companion wether through the wall one day. Goat Town USA Gaius never got aggressive that way. He was easy going, definitely top buck, but generously allowing Louie to stay with him. The truth was, Gaius hated to be alone. That first fall Gaius was eager to be a big Nubian buck. Those does in heat were so interesting. He had a problem. He was six inches too short. Nubian buck Gaius seemed to get redder as he got older. Maybe that black helped deepen the color. he was always confident, but always had time for a neck rub. The barn has a cement step in front six inches high. Gaius watched me back a doe in heat up to the step. Perfect. The next fall Gaius waited for my help again for the first doe or two. Then he realized he had gained that six inches and more. He was a very happy buck. One year drought hit and the pastures dried up. The only real browse was along the road. Gaius loved going out. I put a rope around his neck and kept busy doing things checking on him from time to time. 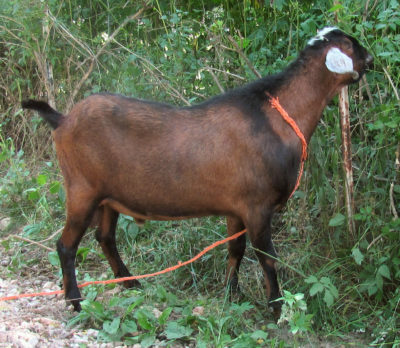 One pull on that rope and Gaius would stop and go with me. He did resist going back in the barn lot a little. It was so much fun being out. Several years later Louie got urinary calculi and was gone in a week. Gaius was devastated. Augustus had been born that spring. goat Town USA Gaius was delighted to have company again. Unfortunately Augustus didn’t have Gaius’ easy going generosity. He was second buck and unhappy. He was always testing. Gaius became ill. And Augustus became top buck. He took over the pen. I set up a pen inside the barn. Gaius recovered mostly. He was happy to be right there with the girls. There were days when Gaius would pose for a picture. 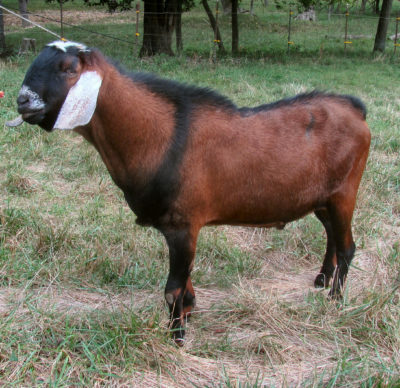 Then he would go back to typical goat behavior and goof off making it impossible to get a decent picture. Augustus would have leaped over the stall wall. Gaius never tried. He enjoyed making out over the barrier. He was delighted any time I forgot to fasten his pen. Last spring Gaius was sick again. He recovered enough to enjoy the summer. Then, one fall morning, he was gone. For all his bravado Augustus is grieving. So am I. 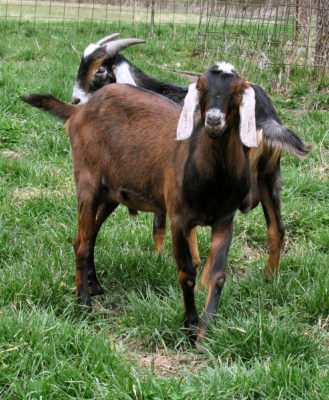 There should be two does bred to Goat Town USA Gaius. Those kids are something to look forward to. 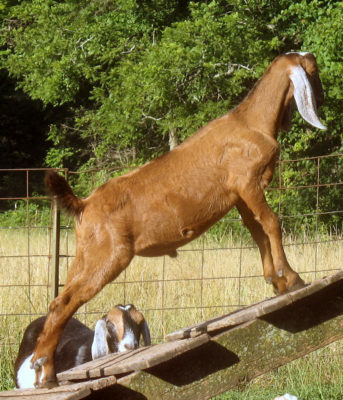 Find out more about raising goats while having fun working pencil puzzles in Goat Games. 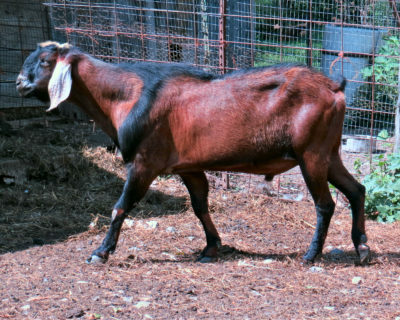 This entry was posted in High Reaches and tagged losing a goat, Nubian buck on November 28, 2018 by [email protected].